Sometimes it’s a meandering path of lessons and learning skills on the way to self-sufficient living. Especially small-scale backyard self-sufficiency. The thought of self sufficient living gets my heart pumping. 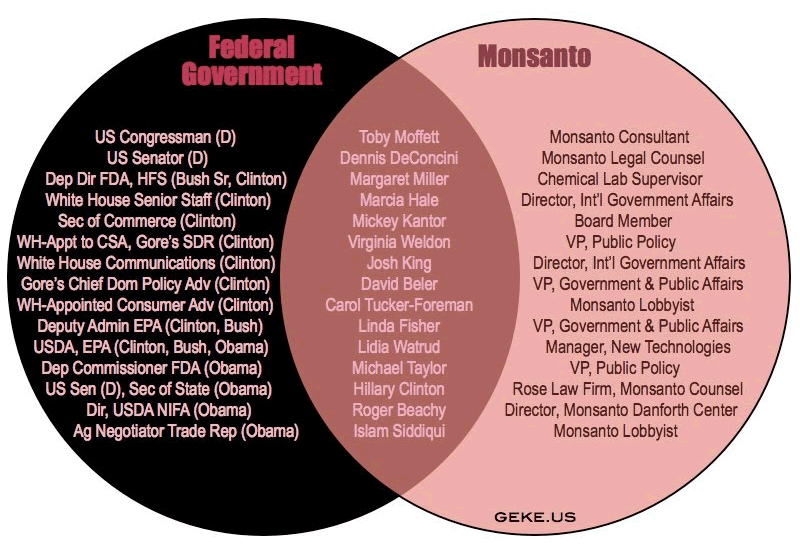 It’s like a big, indirect middle finger to our government and Monsanto. And I dig that. Guest post by Loriel Adams. Not that I’m anti-government or anything. But there’s the corruption and unbelievable ties between an organization that is supposed to be keeping us healthy and an organization that has extremely questionable motives. I have read and seen the lengths these organizations go to in order to stop people who just want to become a little more self-sufficient and less dependent on these organizations. I notice how everything is so well-orchestrated that many folks no longer think for themselves. And that, folks, is a problem. Reading and seeing these things angers me but I wouldn’t say that the anger is negative. I’d say that the anger translates into a passion that ignites my inner rebel, prompting me toward better backyard self-sufficiency. I can’t help it; there’s just a part of me that likes to rebel. I naturally like to go against what “mainstream” says is okay and the idea of “fighting” for something excites my soul. Self-sufficiency means many things to me. The thought of buying less at the store and creating more from home makes me giddy. The potential for reaping the overflowing bounty from a vegetable garden sown and harvested with my own two hands under constant onslaught from Florida bugs makes me giddy. 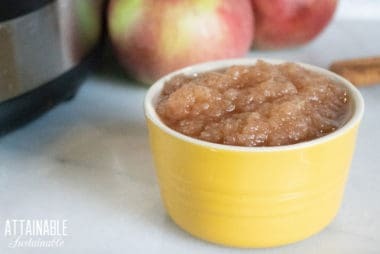 The idea of canning and preserving that fresh produce so I can enjoy the peak freshness when the season has passed makes me giddy. The idea of caring for chickens in my own backyard, waiting long months to finally see that first egg makes me giddy. The thought of keeping bees in my backyard, harvesting sweet golden honey, and creating a safe haven for the suffering pollinators makes me giddy. The possibility of making homemade cheese, bread, and natural remedies using my own two hands—with ingredients from my backyard—makes me giddy. You could say that I’ve failed at it multiple times. I’m actually having a really hard time making these ideas a reality. I go to the grocery store more often than I like. It’s incredibly hard to buy local, fresh veggies in Florida. This is the third season in a row that my garden did not produce anything brag-worthy. Recently it was thanks to a large oak tree blocking all the sun to my veggies. Then some incredibly destructive caterpillars. (They seemed to multiply by ten when I picked them off and fed them to the chickens.) Those caterpillars demolished my healthy pumpkin plants and all nine cucumber plants. I have no idea how to can or make preserves. In this neighborhood I am not allowed to have bees in my backyard. I have made bread from scratch (and surprisingly it turned out well) but I’m slacking on it. I don’t have a dairy cow or goat which makes it harder to make my own cheese. Come to think of it, I really don’t have much coming out of my backyard right now other than eggs. Which, I guess in the large spectrum of things is more than most folks. It frustrates me, disappoints me, and at times makes me want to give up on my backyard self-sufficiency ideals. But, that is not going to happen. I will push through the failures, find ways to make it better. And I’ll continue to search for ways to give that middle finger to them and create a sanctuary of self-sufficiency with my own two hands. With any failures, it’s important not to dwell on them. Instead, we should focus on the successes, even if they are small. For me, my successes have been in raising eight beautiful chickens. 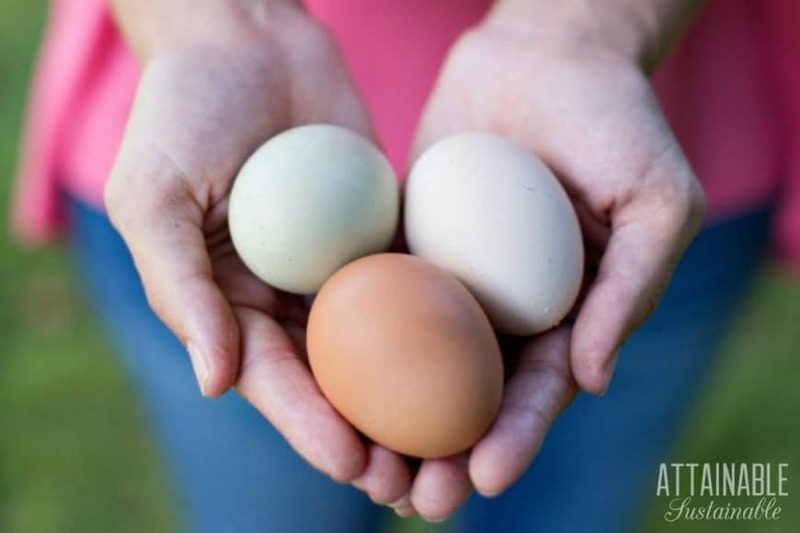 They nourish my family and close friends with the best eggs we could ever have. I harvested a few lettuce leaves from my garden to make a salad. My rosemary bush has not died. We have rain barrels that need to be set up, but we have them. Entirely self sufficient? No. But we’re moving forward. Although I go to the grocery store, 80% of what we eat is made with my own two hands. When it’s available, I buy things in bulk from the few local farms in my area. I preserve them by making spreads and freezing. My husband’s grandmother has a canner and said I’m welcome to use it whenever I want. I am slowly building up my natural remedy arsenal so I no longer have to reach for store bought treatments. The reality is that this whole self sufficient living thing is a journey. As with any journey, it involves many setbacks along with the successes. What I’ve done so far doesn’t seem like a lot to me. But it’s the first couple steps in the right direction. One day I’ll get there. Until then, I’ll just enjoy the journey and ride the waves of life. Maybe you’ll join me in this whole backyard self-sufficiency thing? Next Post: GMO Ingredients for Seasoning Cast Iron? Hi Loriel, I’m on the same path as you. I’m a mother of 7 and I want us to be self-sufficient . I get very discouraged when things go wrong but I know that this is something that I must do. This is my passion. 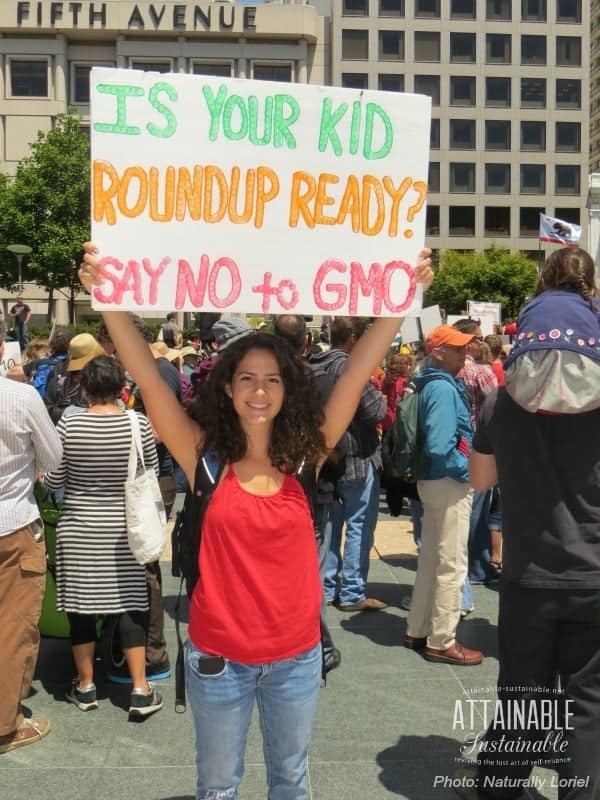 I want my children to grow up with out chemicals in there food . I want everything we use on our body or put in our body’s to be chemical free. We have begun a new Journey. Let’s give our heart and soul to it!! I would love to have chickens but a.) they aren’t allowed in our town and b.) my husband is weird about it. I get angry about the political stuff too – people live in communities BECAUSE it’s very hard to be completely self-sufficient but then certain types like to gain power and force everyone to live within their views. I don’t know if that will ever change, but we do the best we can I suppose. I’m sure you could get away with having a couple hens in a small area in your yard… but hey, I’m not telling you to break the law. I guess that’s my inner rebel speaking out. 😉 I’m not quite sure it will ever change either but I guess the only thing we can do is keep a positive outlook and focus on making change and inspiring those around us. Usually, if you only have a few chickens & name them you can qualify them as pets. Just an idea ? Kylie, I lived in a small town surrounded by farms and we were not allowed to have chickens. It was crazy, but I did it anyway! I built a small coop, enough room for four hens. I painted it the same color as my house sidding and no one ever realized there was a coop much less chickens. The coop had a long run that ran alongside a few bushes and it was next to the house. Our yard wasn’t fenced in and my next door neighbor, on my right, hated everything, even gardens. I made sure my coop was on the left side of the house. The water and gas meters were in front of the coop. No one said a word. My chickens were less noisy than my dog. I didn’t ask nor did I advertise. I kept it to myself and no one in town complained. What I really really like is your ATTITUDE! Even when you have had “failures”, you don’t give up, and that is a great example to be followed. I like growing my own sprouts and greens and plan to continue growing more vegetables. Thanks for sharing! Please visit my blog, it has pictures of Cancun and other stuff. I will join you and I am joining you! I have aspirations to have a garden and have 4 raised beds being built right now. I am scared that I am going to be overwhelmed with yet another task but, really want to explore it. I do expect a learning curve! I envision inviting friends to plant with me, to eat with me. I am not sure about whether or not I’ll keep chickens. At first I was sure I wanted to keep chickens but, I’ve decided to just start with a garden first! Definitely talk to gardeners in your region and find out what grows well there. Starting with crops that are well-suited to your area will give you a good chance of success. Right, never give up has to be a gardener’s overall credo. I’ve moved every three years for over 30 years and have created a few gardens “where no gardener had gone before”. Some have been more productive than others and, frustratingly, the best season ever is always the year we move away! Hang in there. I totally understand Sandrine. I guess it’s just learning to make it part of our daily habits… you know? I I actually put my garden beds NEXT to my chickens because I knew that I have to go out there daily to check on them so then I’d be forced to check my garden. 🙂 Whatever works, right? I think if you really invest the time in thinking and creating a space for your hens, it can really be low maintenance. We put hardware cloth around the bottom and anywhere predators could possibly get in which enabled us to keep the coop door open at all this. This lets the chickens go in and out as they please so I don’t necessarily have to get out there first thing in the morning. Obviously, it also depends on how the predators are in your area, but there are ways around making it much more easier on you. 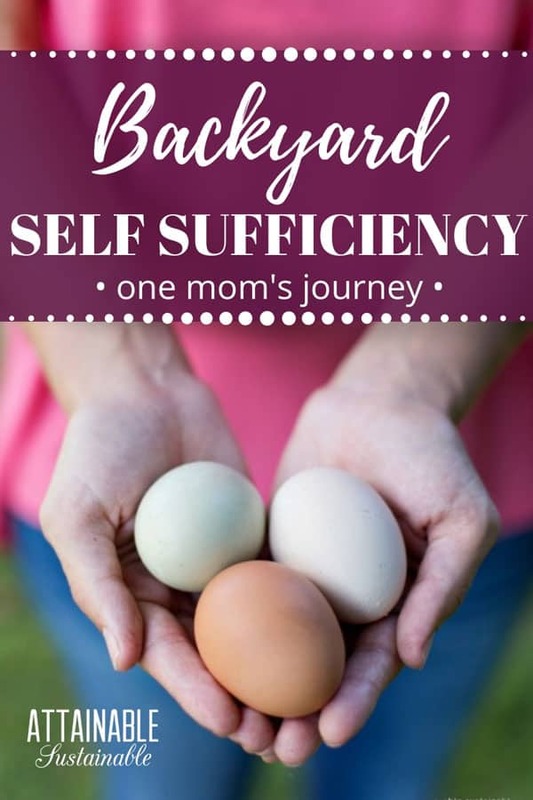 Loriel – That you and I have the same definitions of self-sufficiency makes me giddy! Thank you for sharing where you are in your journey. I was relieved to find out I wasn’t the only one with really big dreams that are slow to manifest. But I keep chugging along, trusting that I’ll get there some day and have great adventures along the way! Hey JB. Oh man, if anyone has slow manifesting dreams regarding their homestead, it’s surely me! It’s so overwhelming, too, when there are so many things to implement and you just don’t know what to do first. Not to mention there is an incredible amount to learn! I’m hoping this new year will manifest many dreams for you and your journey to self-sufficiency! I can identify with this so much!! I really want to have a ‘hobby’ farm, but I live in an apartment. Herbs on the balcony is about as far as I can get right now, although I try to buy local and preserve what I can.My husband warns me that my dreams of farming aren’t as romantic in real life, and I know it’s hard work, but I want to at least give it a go and persevere through the set backs. Thanks for the real life example of someone doing that! Kudos for doing what you can in your small space! Is there a community garden nearby – or space for one – that you could participate in or start? Hey Naomi. It’s funny how our realities are often very different than our dreams, but sometimes, it’s just worth it regardless. I love that you have herbs on your balcony because that is a great start. I don’t even have herbs… lol. We do have a rather large oak tree in our backyard that NEEDS to come down so it lets some sun in so my plants can thrive. I’m really hoping that once we do this, I’ll actually have something to be proud of. Good luck with everything! One way to have a great garden is to nourish it and prepare it in the fall/winter for the next year, and one of the best ways is compost and/or manure (especially if you don’t have room for a compost pile). Find a stable in your area. I have found that they usually let a person have (that is less shoveling for them) or sell at a minimal price, OLDER MANURE WITH STRAW. A garbage can full should do for a small garden. After turning it into your garden, let it rest through the winter, and your garden will be ready in spring to be worked. Don’t forget to rotate your crops. For your bug problem, try making your own bug sprays they work and are inexpensive. They are fun to make also. Example; put leftover beer into lids to drown slugs. Try combining cinnamon and black pepper then put a thick line around each plant. The soft bellied bugs will not cross the harsh mixture. There are hot sauce sprays with soap that will keep bugs from eating plants also. Excellently written, and much the same as what I tell people when they react to our lifestyle and food choices with a “how on earth do you do it? !” reaction. It’s a journey. Read, read, read. Learn all you can. Companion planting has really helped my bug issues, as has sprayed-on organic fish fertilizer. However, I am a northern gardener, so my bug issues are probably quite different. I love your rebel attitude…. Have a solid dose of that myself. ? I tend to have a history of biting off way more than I can chew… 🙂 I find myself often stopped by the fear of failing but I have to remember that is the only way to learn. It is definitely overwhelming when there is SO MUCH to learn at one time. This was my first season trying companion planting but I didn’t do a very good job of it. This next season, I’ve learned a little so I’m hoping this will help. Florida seems like one of the worst places to grow (the bugs are seriously terrible) but I am *not* going to let bugs win completely! Let the chickens wander in your garden a few times a week — they’ll do a better job picking off the caterpillars than you ever could! Unfortunately, I can’t let my chickens out in the yard just yet and I’m not sure they wouldn’t completely kill and scratch up my garden. It could be worth a shot though when I’m able to let them roam free. I’m in Ontario Canada, and I am SO jealous of your Florida sun all year ! We are having a blizzard right now but my journey is the same as yours. I wish your garden much blessings this year ! They make it hard, but our grandmothers could figure it out, so can we ! Wish I could share our sunshine with you! Stay safe up there and thank you for the blessings. This year my garden *will* be abundant. I am with you. Also trying the self sufficient thing. Having a bit of a rough time. free ranged chickens until we lost several to wild life in the area, now they are cooped. Had a great garden with 50 tomato plants full of green tomatoes, then a herd of deer came thru one afternoon and literally topped all the plants. Last year, planted a beautiful batch of peas which the wild rabbits got. The successes are the old apple & plum trees on the property and last years crop of sun chokes, the (now cooped) chickens and the domestic rabbits for meat. Still have a lot to learn though, this year, we are going to try a few mushroom logs. It’s a constant learning process, isn’t it? Four years ago we bought a house in the country. Though only one acre we still have room for a large garden and chickens. At one time our property was a cow pasture. So the soil is very rich. Unfortunately, with my job (and a commute) and a child and the usual household chores, there is not a lot of time for everything that I want to do. Ultimately, I would like to raise as much of our food as possible. (I don’t eat meat, so I think I could achieve this goal) I live near New Orleans, so we have a long growing season. I envy your soil! Can you get a few tomatoes and a zucchini in the ground? If nothing else, they’ll provide a portion of your diet for very little work. Only the cherry tomatoes have done well. I’ve had no luck with regular tomatoes. And melons. But everything else has done well. We planted blueberry bushes a few years ago and last year they produced like crazy. Sweet potatoes are work intensive but worth it. For those without the space, I’ve seen sites that show you how to raise potatoes in a laundry basket. Nothing tastes better than fresh produce. BTW, I am not giving up on tomatoes! I had those worm things pictured in the last picture too! I found equal parts flour and baking soda sifted over my plants got rid of them! Thanks for a well wrote article! It is so wonderful reading about so many wanting to be self sustainable. I have these dreams and aspirations also. My husband and I bought some property and moved onto it about six months ago. We are living in a pop up camper and a tent until we can build our house. I plan to have a garden but until I get the space ready I plan to grow in pallets. I plan to have chickens, bees, and goats. I want to can and preserve as much of my bounty as possible. I know it will take time. It seems like a lot to undertake but as the saying goes, “how does one eat an elephant? One bite at a time” so I go about my dreams, one day and one project at a time. You give me hope and inspiration. Just knowing that I am not the only one with these dreams is great comfort. Thank you for writing about your adventure. Reading your comment gave me the chills Debbie! I’m so excited for when you get the opportunity to start really putting your dreams into reality. I think that the easiest and fastest way to become self efficient is to NOT overwhelm your self with too many projects. Start building with in your means. I have 6 chicks for starters. Once they are outside in their coop, Im thinking about shopping for Turkeys, but undecided if I should go start a garden before I bring home more animals. A lot of thought and planning is needed to become successful. However there is nothing wrong with biting the bullet and jumping right in. You will have to make sacrifices but you can do without. Im already dreaming of goats but Im not ready for that yet ? But there are so many projects to ponder! 😉 I think you’re right. I like to make a “short term” plan and a “long term” plan. That way I can still keep those long term ideas in mind for planning, but not overwhelm myself with everything! It’s awesome to see someone trying like us others to make our world better by bringing ourselves to self-sufficiency. Although I don’t see it as helping self but helping out little part of the world. The more people that do this the more the world will be healed. Great article! Sounds just like what I’ve been doing. I live in TN and started trying to be self-sufficient when my twins were born 9 years ago. 3 years ago I decided to turn my whole yard (3/4ths of an acre) into a fruit and vegetable orchard (my garden of eden). I am so excited and very please with my substantial amount of lettuce greens, radishes, squash, cabbage, etc. Wood chips are definitely the answer. Very little maintenance except for replanting and harvesting. Canning is not my thing, but I know I have to get on board so I’m working on that. It is the little things that count like making your own laundry detergent, toothpaste, home remedies, etc. I know I’m heading in the right direction because of my families health and I’ve peaked interest of all those around me. I plan to do low tunnels this fall to extend the growing season thru the winter and we just got chickens which we’re not supposed to have, but nobody seems to mind. Everybody is asking for eggs when they start laying. I don’t know that we will ever be 100% self-sufficient, but I know the more we do for ourselves, the better off we are plus the money we save. 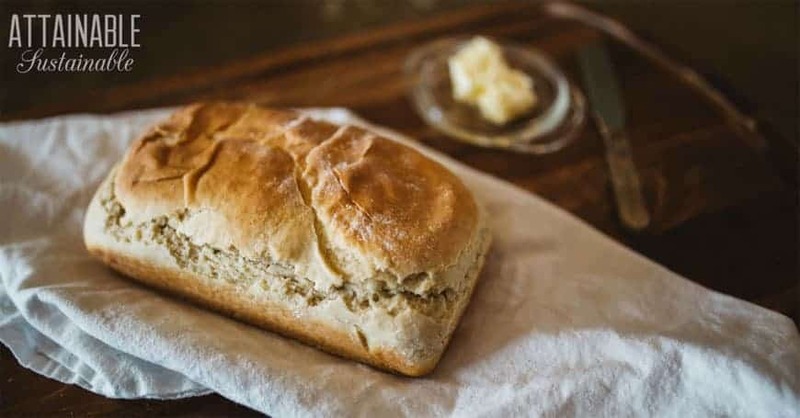 I do make my own bread once and a while and need to start on a more regular basis. Thanks for sharing. I moved half way around the world to pursue a self-sufficient lifestyle and have given myself 5 years to get there. I took over a homestead that had been abandoned for 10 years. The first year I just watched and experimented with planting things whilst I built up a huge compost heap. I watched how I use the garden and its outbuildings, I watched my neighbours gardens, I watched how and where the sun hit throughout the day and across the seasons. I watched how I needed to function during summer temps of 30c and winter temps of minus 30c. It was the best thing I could have done. It is hard to accept that it can’t all be done at once. I don’t have the room for a dairy cow and the closer I get to the earth, the less I think I want to put another female through that whole cycle just so I can have milk, butter and cheese. I am finally ready to take chickens but have a hard time thinking about what happens when they no longer lay. My personal notion of self sufficiency is that if I can’t produce it myself, I need to get it from as close to the source as possible eg. flour from a nearby mill who purchased grain from the farmers in my neighbourhood. I realise this means there are many things I will no longer enjoy such as citrus fruits which are not native in my adopted homeland, or olive oil, or any one of a long list. Slowly, I am giving them up and exploring other options like growing stevia instead of using sugar, making vinegar from my grapes to make my own ketchup. I regularly beat myself up for not doing all of this right now. But just as I am learning that you can’t hurry nature, I am learning my place within nature. It will happen because I want it to happen. It just might not be happening today or tomorrow. Be kind to yourself. …and sorry for the epic post. What a wonderful comment! Yes, I think waiting and watching is crucial to help us use our space the best way we can. And remembering that we are only one person and can only do so much. Small steps. Enjoy your homestead! I really enjoyed reading your story. My family and I are on the same journey and it seems to be more along the lines of a great comedy! We live in SW FL and are learning to grow a lot of things here. This year we are going to experiment with permaculture to see if this will help with our yields. Right now the only thing we have established is an orchard on our 10 acre farm. I hope to have a small garden and chickens in the fall. We have been working on our orchard for the last 2 years and recently just moved to our forever country home on 5 acres which is just past our 10 acre farm. I look forward to reading more about your journey! I am in Spring Hill, Florida and understand completely about setbacks to gardening in Florida. I do really well with carrots, sweet potatoes, hot peppers and beans. I have not been able to successfully grow cucumbers, squash, watermelon or cantalope and have had only middling success with tomatoes, onions, beats and turnips. I have been gardening 40 years and have never had so much difficulty as when I moved to Florida 12 years ago. We are fighting bugs of all kinds, rain when it is least welcome, poor soil and extreme heat for much of the year. I do much better in the Fall than in the Spring and Summer. I have finally started composting this year and am looking forward to trying my hand at worm composting next year. Don’t give up though as I know other people are having success down here. Lovely post.Thank you for sharing your failures, frustrations and successes. I know from experience gardening is a huge science experiment. Some years things grow well and other years a complete failure. I have been adding passion fruit from seed to my garden boarders. 3 years later I have two plants out of 20 alive. The good news is that they have adapted to my climate and are hardy. 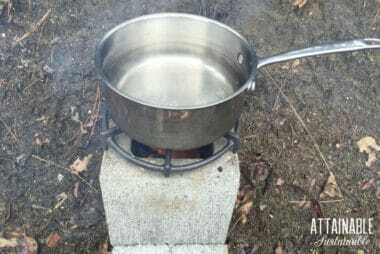 I too am going back to being self-sufficient. I grew up on a small farm so we had the chickens and large garden. My husband and I purchased a 2 .4 acre plot deep in the country where in the spring I plant to get 8 or nine chicken. I did learn to can and make jelly from my mother so I am very good at it. What you don’t know you can learn. My fruit tree and 3 vine vineyard lol will hopefully make enough jelly to have ad sell at the local farmers market. I plan to get a bee hive also in the spring to make extra money also. My children are grown but I would like to make enough from the sales from my small farm to be able to quit work. If I could have only done it when I was your age I believe I would be there now. Don’t give up you will get there. My daughter is your age and doing everything I taught her. Good luck and know you are doing a great thing for your family. Thank you so much for your honesty. What you gave to us is the feeling that we are all in this journey together, and that is a very encouraging feeling! I’m envious of those who can keep chickens. My husband is allergic, so I don’t want to risk it. But if you keep chickens, I keep bees, other readers have green thumbs, and so on… then we start to get there, together, and build our community. In the end, isn’t that better than each of us being able to do it all? I enjoy your posts, as always. French Onion Dip Recipe: Mix Up Your Own!